Это универсальная программа, которая сочетает в себе поддержку GPU-ускорения обработки изображений, поддержку слоев, поддержку прозрачности со всеми функциями регулировки изображений из режима редактирования. ACDSee - функциональное приложение, рассчитанное как на профессиональных фотографов, так и на любителей. ACDSee позволит работать с цифровыми фотографиями, RAW-изображениями и поддерживает более ста форматов графических файлов. Также программа осуществляет быструю пакетную обработку большого количества файлов с эффективным визуальным методом присвоения изображениям метатегов. * New look and feel! Updated GUI, tear off, move, stack, and dock more toolbars and panes than ever before. * You can now show and hide mode switching buttons for a new compact view. * New Smart Brush allows you to brush on image adjustments and create selections using auto-masking technology to affect only the pixels you want. In both Develop and Edit modes. * New Selection Brush with edge detection. * Improved Noise Removal. Added Preserve Detail and Preserve Detail Threshold slider (Edit and Develop mode). * New Mask Properties panel adds overlay previews, inverting, and non-destructive feathering. * There's now even more ways to filter Photos mode to display photos from specific areas of your hard drive, Microsoft OneDrive™, or your entire collection. * Improved speed and performance, with GPU-enriched Develop mode and Layered Editor. * Moving sliders in Develop mode is now faster. * Zooming in and out in Edit mode with layered images is faster. * Switching to Edit or Develop mode from large folders is faster. * Photos mode is now faster than ever. * Fixed an issue when ACDSee moves a layer and commits, everything outside of the editing area will be cropped. * Improved Blur panel, now easier to identify and select the Blur type. * Eye Dropper can now select background color with right click. * Color Picker is now available while drawing using the Color pane. * Draw Brush draws with foreground color with left click and background color with right click. * There is a new option in the Color Picker to go back to default black and white colors. * New lens correction profiles and updated calibrations. * Selection is now transferred to layer masks. * Layer masks can now be added, intersected, and subtracted from the selection. * Content of iPhone and other WIA devices does not display correctly when browsed directly with ACDSee. * In some cases, on Windows 7 and 8, when a camera is connected to a computer via a USB cable, the Import tool may fail to display media files and will not copy them. In these cases, we recommend copying items from these devices to your computer with Windows Explorer or import the media through a card reader. * ACDSee uses the base layer's color profile for any additional layers. * ACDSee Layered Editor, when in the Move tool, you cannot add masks. * Text/Watermark shows incorrect preview in a certain scenario. * Color images turn into black and white when added as layers on a grayscale image. 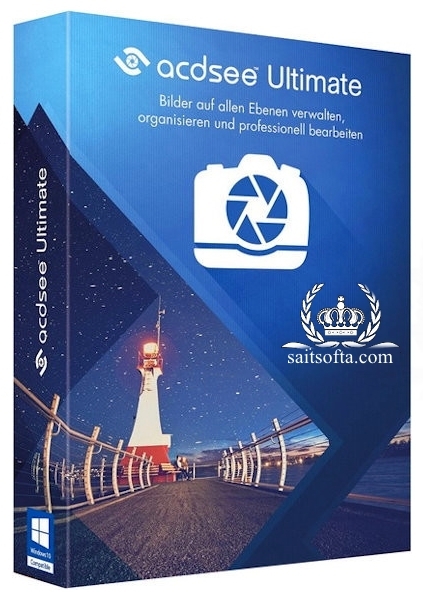 * It is recommended that you restart ACDSee after importing a Lightroom database. * ACDSee Actions created in Pro 9 and Ultimate 9 are supported in ACDSee Pro 10 and Ultimate 10. * ACDSee Actions created in Pro 10 and Ultimate 10 are backwards compatible with Pro 9 and Ultimate 10. * ACDSee does not preserve layers when editing PSD and TIFF files. - Smart Erase. Remove unwanted objects and the Smart Erase tool will fill in the area naturally. - Actions Browser. Record your editing process, categorize and manage recordings, and batch apply any of 125+ pre-loaded recordings to multiple images at once. - Grain Tool. Give your images an old, film grain look with the Grain tool. - Liquify. Retouch portraits by moving pixels, not changing them. *Not supported on 32-bit. - Pixel Targeting. Select and mask by targeting specific brightness ranges and colors within the image— even skin tones. - Polygon. Selection Tool. Select around edges and irregular shapes with the Polygon Selection tool. - Chromatic. Aberration. Heal colored fringes on the borders of high contrast areas with the Chromatic Aberration tool. - Lens Correction. In Edit mode, correct barrel and pincushion distortion by applying the fix calibrated for the distortion inherent to the lens used. - Improved. Performance. Brushing is now 400% speedier! Also enjoy faster undoing and redoing, as well as Drawing tools, such as the Airbrush and Eraser tool. - Keyboard. Shortcuts. Whip through your process with hot keys available for every stage of your workflow. - Improved. Import. Avoid uploading the same old photos again and again with an import tool that remembers your previously imported photos. - Categories/Keywords Panes. With Keywords and Categories on their own respective panes, you can enjoy proper space for managing your ever-growing hierarchies. Для корректного запуска и работы программы, требуется установленный Microsoft Visual C++ 2015 (лежит в архиве) ! Если не идёт на Windows® 10/8, то запускаем от имени администратора! Программа на русском или кей ?